In this study, nanoalumina and nanoclay particles were compounded separately with ethylene vinyl acetate (EVA) polymer to produce nanocomposites using a twin-screw extruder to investigate exposure and effective controls. 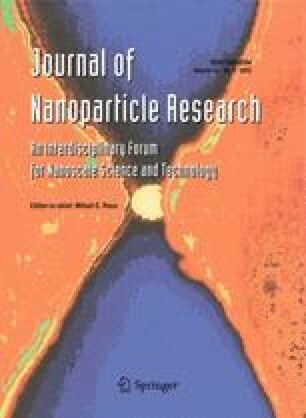 Nanoparticle exposures from compounding processes were elevated under some circumstances and were affected by many factors including inadequate ventilation, surrounding air flow, feeder type, feeding method, and nanoparticle type. Engineering controls such as improved ventilation and enclosure of releasing sources were applied to the process equipment to evaluate the effectiveness of control. The nanoparticle loading device was modified by installing a ventilated enclosure surrounding the loading chamber. Exposures were studied using designed controls for comparison which include three scenarios: (1) no isolation; (2) enclosed sources; and (3) enclosed sources and improved ventilation. Particle number concentrations for diameters from 5 to 20,000 nm measured by the Fast Mobility Particle Sizer and aerodynamic particle sizer were studied. Aerosol particles were sampled on transmission electron microscope grids to characterize particle composition and morphology. Measurements and samples were taken at the near- and far-field areas relative to releasing sources. Airborne particle concentrations were reduced significantly when using the feeder enclosure, and the concentrations were below the baseline when two sources were enclosed, and the ventilation was improved when using either nanoalumina or nanoclay as fillers. The online version of this article (doi: 10.1007/s11051-012-0989-z) contains supplementary material, which is available to authorized users. Authors would like to acknowledge the financial support from the Nanoscale Science and Engineering Center for High-rate Nanomanufacturing (CHN) funded by the National Science Foundation (Award No. NSF-0425826), the Program of Research Education for Undergraduate students associated with CHN, and the collaboration with National ChiaoTung University funded by the Taiwan Institute of Occupational Safety and Health (Grant No. IOSH98-H324). Doctoral student ChunChia Huang and technician Christopher Santeufemio of UMASS Lowell provided support for the TEM image analysis.